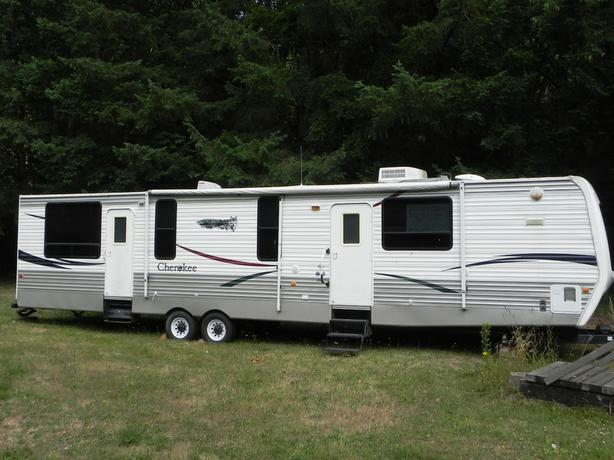  Log In needed $24,995 · 2007 Cherokee 39 foot trailer with 2 slide outs. This is a BIG unit you can use for full time living with 2 bedrooms one with a slide out in the master bedroom. Well equipped kitchen with house size fridge. Living room and dinette slide out makes it even BIGGER. Large flat screen TV (on the master bed) installs in the living room area. Roof A/C for those hot days and so much more. Call Doug at 250-748-2277 for appointment to view this great RV or if you have more questions or want to come out and see it then... Please call owners land line phone direct at 250-597-1218 for more information. If no answer please leave a message and we will get back to you ASAP.